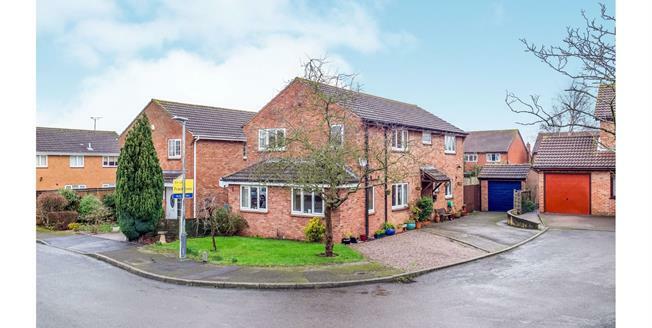 With great space on offer, this immaculately presented, four bedroom detached property is ideal for any growing family. The property which is situated on a quiet cul-de-sac in Kinoulton, has a dining kitchen, good size lounge, study/family room and cloakroom to the ground floor. To the first floor there are four double bedrooms, two of which have modern en-suite shower rooms, there is also a bright family bathroom. Outside the property has an excellent driveway which can accommodate several cars, there is also a detached garage and a lawn area to the front. To the rear, there is an enclosed garden with patio, lawn and pond. The space on offer would make an ideal home for any family. We strongly recommend an early viewing to avoid disappointment. Accessed via a covered porch, this bright entrance hallway has a upvc and double glazed door to the side elevation, double radiator, good size under stairs storage cupboard, doors leading to various rooms and stairs to first floor. Vanity unit with wash hand basin, tiled splash back, low level w.c, double glazed window to side elevation, heated towel rail. A lovely room offering great space comprising, double glazed window to side elevation, double glazed window to front elevation, two double radiators, feature fireplace with coal effect gas fire, stone hearth and mantle, tv point. Double glazed window to side elevation, double glazed window to front elevation, fitted desk and storage unit, radiator. A lovely room with dual aspect comprising, wall mounted and base shaker style units with roll top work surfaces, inset double stainless steel sink with mixer tap over, integrated dishwasher, electric oven, microwave, electric hob, stainless steel extractor hood, plumbing for washing machine, space for large fridge freezer, tiled splash back, tiled floor, radiator, double glazed window to side elevation, two double glazed windows to rear elevation, double glazed French doors to rear elevation. Double glazed window to side elevation, access to the loft which has been insulated, airing cupboard with hot water tank. Double glazed window to side elevation, fitted wardrobes, radiator. Modern suite comprising, walk in shower cubicle with wall mounted controls, pedestal wash hand basin with mixer tap, low level w.c, tiled walls, double radiator, double glazed window to front elevation. Double glazed window to front elevation, double radiator. Modern suite comprising, walk in shower cubicle with wall mounted controls, pedestal glass wash hand basin with mixer tap over, low level w.c, tiled walls, wall mounted light, extractor. To the front the property has a lawned area with a mature tree, to the side there is a good size driveway for several cars, in addition there is a gravelled area which could accommodate further parking, there is a detached brick built garage with up and over door, power and lighting and side access to the garden. To the rear of the property the garden is enclosed with patio areas, lawn, pond and planting.